Plenty of Fish (also know as POF) is one of the most famous free dating website of the world. There are lots of fake accounts on the website since it has a good popularity. 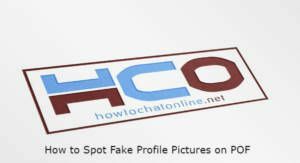 We are going to give you information on spot fake profile pictures on POF and how to spot those images. You can also ask us for more details via commenting this page. There are various ways for spot a fake profile picture on POF. Firstly we recommend you to search profile picture and other pictures of your partner. Go to the profile of your partner. Right click on your partner’s picture. Click on “Search Google for image” button from the menu. If you see similar results on the search results. Please see if your partners name, location details are matching. Go to profile of your partner. Right click on her/his pictures and save them. Locate your picture and open it. Locate a picture that you want to search. You have talked with someone for days on POF but you are now curious if she/he is fake or not. The most reliable way to spot a fake account is asking for a social media account. People won’t want to give their social media account to you at first times. However if you speak with someone for days, he/she can do it easily. If your partner is refusing to share his/her social media account with you, you can get suspicious. New social media accounts are also questionable.